In the world of wedding, nothing seems to be free…until now! 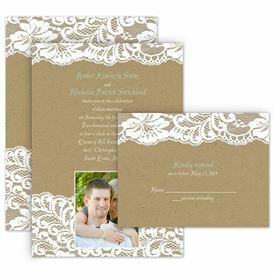 Ann's offers an entire collection of wedding invitations with free matching response cards. If you've been invitation shopping for a while now, you know that means big savings. These wedding invitation sets with free response cards will help your wedding budget stretch even further. 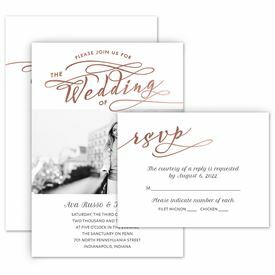 The response cards are designed to match the wedding invitation cards, which means you can afford a beautifully coordinated ensemble for far less than purchasing each piece separately. Most of our wedding invitation sets come with response postcards, which save you even more money. You'll spend less on postage and guests will appreciate how easy it is to drop response postcards in the mail. Plus, guests are sure to be surprised by how stylish the response postcards are. Postcards are usually chosen for efficiency and low cost, but we like to make sure our response postcards are just as stylish as any other piece of stationery we offer. Not finding the design of your dreams in this collection? 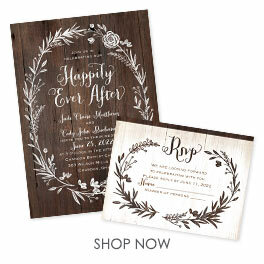 Check out our full selection of wedding invitations.